The tower of this Church is at the west end of the South aisle and it is thought that perhaps this aisle was the original Church. This beautiful Church, of the early decorated period, was enlarged during the years 1294 – 1332 during the incumbency of John de Gurnay who was also the patron. It has considerable perpendicular period additions. It was built by Sir Robert Knowles (Knollys) a famous general in the wars with France in the reigns of Edward III and Richard II. He was a Knight of the Garter. The chancel was erected by John de Gurnay in the early 14th century. St. Lawrence Church, Harpley, Robert Ladbrooke 1800's. The South aisle windows with their Y tracery are late 13th century. The attractive battlements were added in the 15th century. A line is visible on the wall above the windows which shows the line of the roof before the battlements were added. 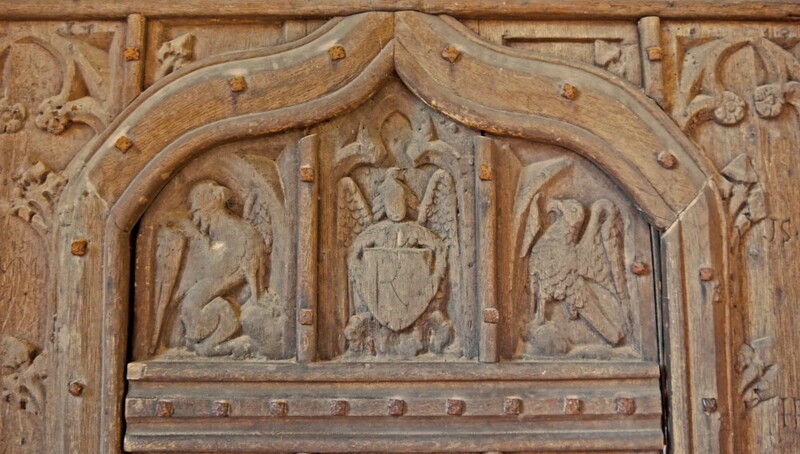 The battlements built by the Knowles family are enriched by carved shields bearing their arms, the grid iron of St.Lawrence and also the arms of many other benefactors. Note the animal (lion) on the offset of the buttress and the gargoyles of the rain water outlets. The Priests Door has a beautiful cusped and crocketted ogee arch. It is late 13th century and the steps to it are unusual being round. There is a curious inscription just to the West of this door on the wall to a child called Protestant which is probably his own composition. The low window to the West of this which is now blocked is not thought to be a leper window. Opinion is divided on this but one source maintains that the sanctus bell hung outside the Church and the sacristan sat inside this window, putting his arm through to ring the bell by a rope which hung down outside. The East window was restored in 1701. The jambs of an early window are still there and parts of the original mullions are visible in the East wall of the chancel. 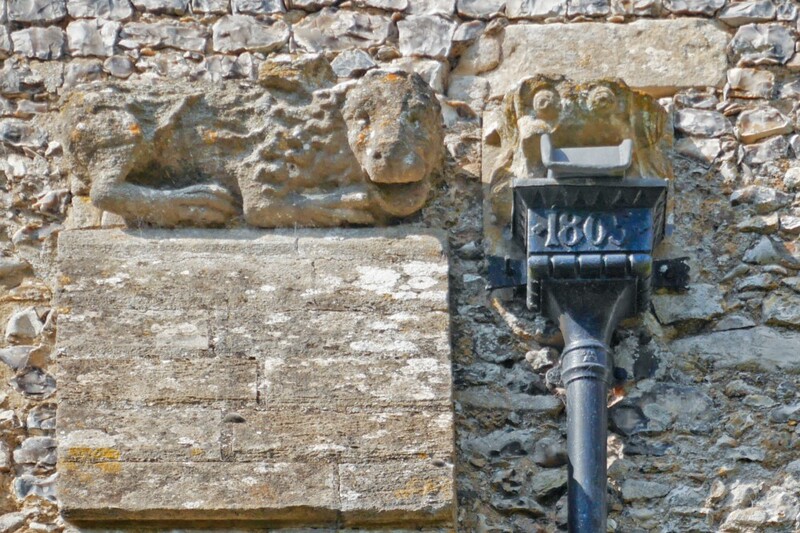 The crocketted gable coping above is unusual and might be a series of animals. There is a floriated cross on the East end. The vestry on the North side of the chancel was restored in 1849. 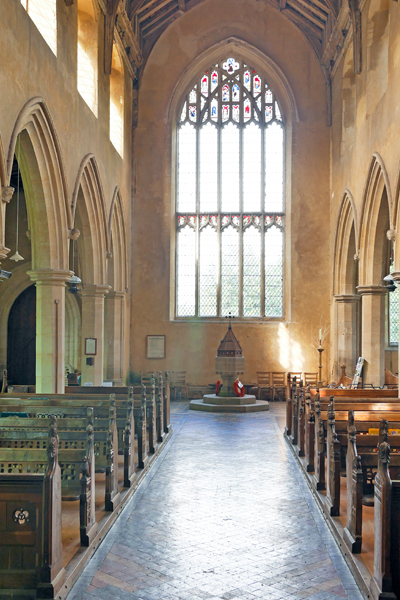 The North aisle is mainly perpendicular period which is not as striking as the South aisle. The North door is decorated period. The tower at the South West corner of the Church was rebuilt in the 14th century and made capable of defence by having extremely thick walls and only slits or square headed lancets in the lower stages; these are designed to give maximum light with minimum aperture. There are 5 bells in an ancient wooden frame which has been adapted from an even older frame for 4 bells. The bells are 1. Treble cast in 1902. 2. Brasyer c 1500. 3. Thomas Newman, 1710. 4. Ellas & Thomas Brend of Norwich 1659 5. Tenor, Thomas Newman , 1731. The South Porch is early 15th century. It has 3 niches and some panelling. The figures which were in the niches were probably removed by Edward de Gurnay in the 17th century. He wrote a “Homily against images in Churches” which was published in 1639. He never wore a surplice until ordered to by the Bishop of Norwich and thereafter he always had to wear one. The interior of the porch has panelling and 2 windows on either side. 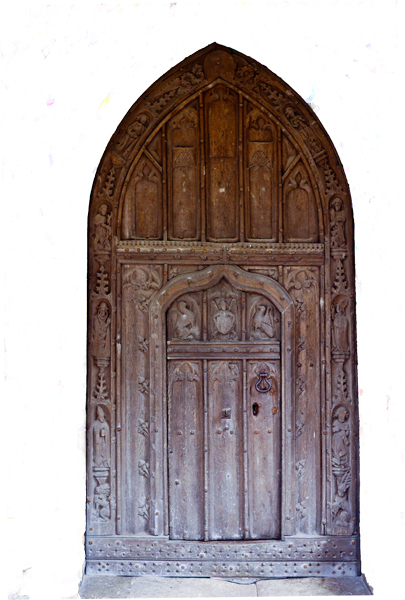 The South door is perpendicular and is probably the finest carved door in the county and one of the best in the whole country. It has tudor roses, crockets and rich canopies. The wicket is traceried and has signs of St Luke and St John. There are niches running from the sill of the door with mutilated figures of Saints and the Four Doctors of the Church ( Gregory, Jerome, Ambrose, & Augustine) There is a lion at the bottom of the door and a stag at the East side. The carving at the top of the door. The great West window has 15th century glass which is worth studying through binoculars. A dozen figures of Saints can be traced here! The central feature is the Annunciation, with Kings Edmund and Edward the Confessor seated below, and they are flanked by St James the Great and St John the Evangelist. Around them are various Bishops & Deacons ; L to R , Ledger, Vincent. Lawrence, Wilfrid, Thomas of Canterbury, Martin, Stephen, Blaise and either side of the central panel are James the Great and John the Evangelist. Below there are ten angels from the three heirarchies, Seraphim, Cherubim, Thrones, Dominations, Virtues, Powers, Principalities, Archangels and Angels. Some are holding symbols to indicate who they are. Note the angel carrying a urine flask. This is one of the Virtues and normally are shown carrying a pyx or censer. Urine flasks were associated with the medical profession in the Middle Ages and this may indicate the powers of Angels to perform healing and miracles. This great West window has written in Latin “Ora pro nobis” (pray for us) against the donor’s facsimile. above right. © Mike Dixon. You can see more high definition photo's by Mike on Norfolk Stained Glass - click here. 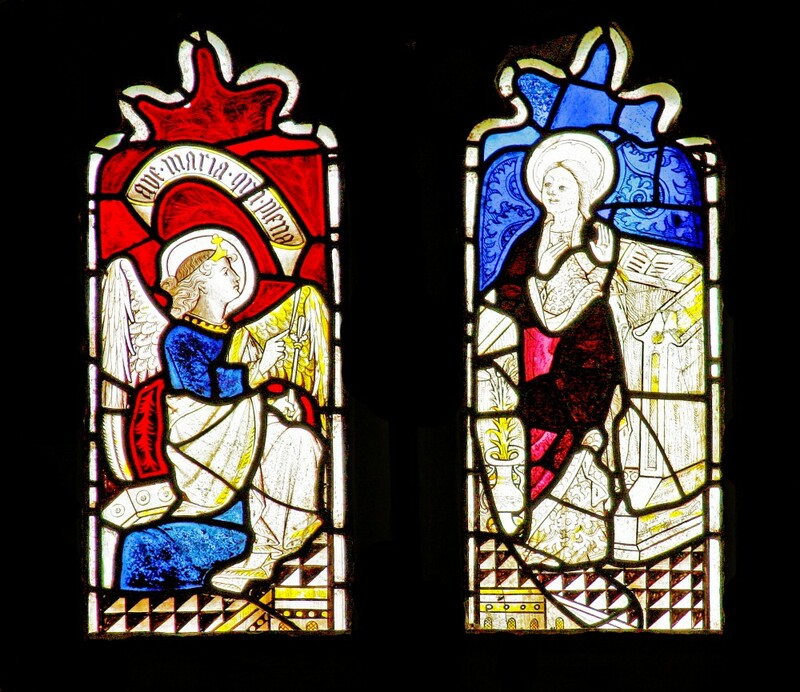 There are more photo's of the Angels and Harpley's other windows on the Stained Glass Window page. Click here. The Annunciation as the Angel Gabriel tells the Virgin Mary that she is to give birth to Jesus. On the left is that great pilgrim Saint, St James and to the right is St John. It is related that he was given a goblet of poisoned wine at Ephesus, but he blessed the cup and the poison left in the form of serpents and he was saved. The Nave. The wall seats at the West end were there before there were any other benches. on the arms like a squirrel. The front bench on the North side has an inscription which reads “John Martin 1638”. The North and South arcades are of 5 decorated period bays and were built in the late 14th century with narrow octagonal piers with decorated caps and bases and double chamfered arches. There are hood moulds over with sculptured heads forming the stops. The clerestory has great 3 – light windows built at the same time as the North aisle; these are super mullioned. 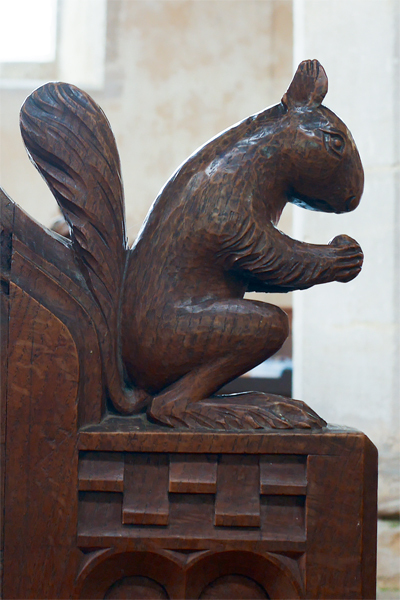 The nave has a flatish oak roof with carved cherubs holding shields mostly bearing the arms of Gurnay (1294 – 1332). The nave roof is arch braced of the 15th century and it has knuckles at the top instead of collars. There is a deep cornice with a series of angels. In the South aisle the East window contains some early 14th century glass and it has 5 uncusped lights. Originally each light contained a full length figure in a rich tabernacle. The SE window has modern stained glass. There is a fine graduated sedilla and double piscine with cinque-foiled arches and detached columns on the South wall. 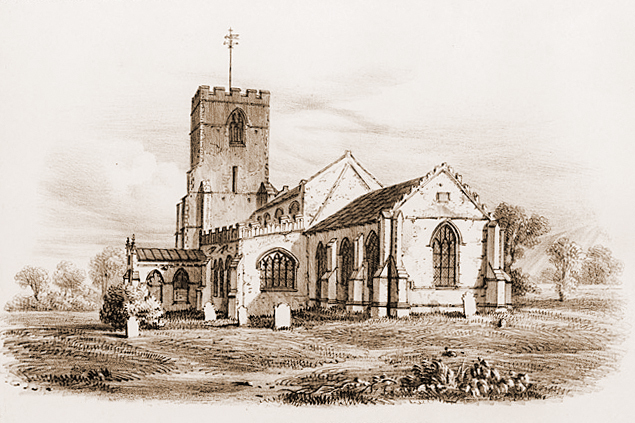 This was the original Church before the nave and chancel were added to it. Note the position of the tower with its Norman foundations in line with this aisle. Saxon Piscina. In the North aisle there is a small recess in the North wall of the modern organ Chamber. It has a drain similar to other piscinas. Its triangular arch is a Saxon feature so it may well be a relic of the sanctuary of an older Saxon Church here. 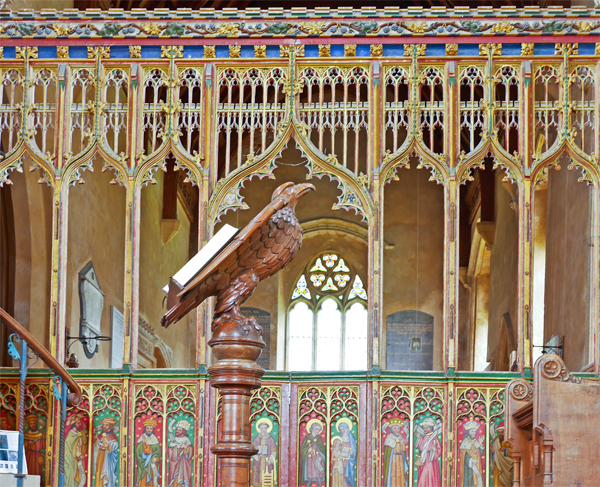 The Rood Screen is very tall with one light division and fine tracery and dates perhaps from the 14th century. The screen shows the Prophets Zacharias, Isaias, Amos, Micheas (Micah), Abdias (Obadiah), Daniel, Jonas, Jeremiah, Joel, Osea(Hosea), Ezekial, Malachias. The doors show the Blessed Virgin Mary and Child with St Lawrence and St Joachim and St Anne and the child Mary. (with her parents). 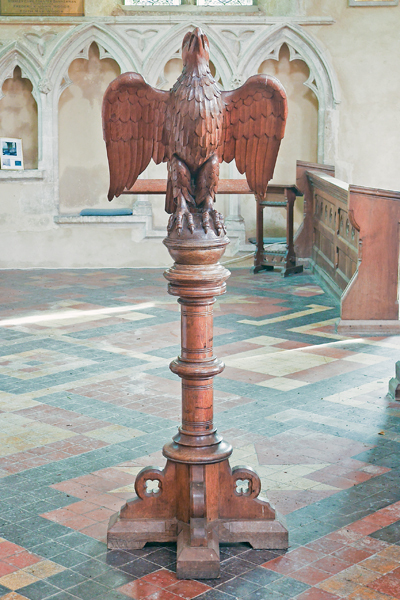 The rood staircase is within an internal octagonal turret entered behind the pulpit. The present East wall of the North side of the nave was probably built after the reformation because it goes straight through the rood staircase. The entrance could then have been a cupboard because the door hinges are still there. The chancel arch is the earliest part of the Church. 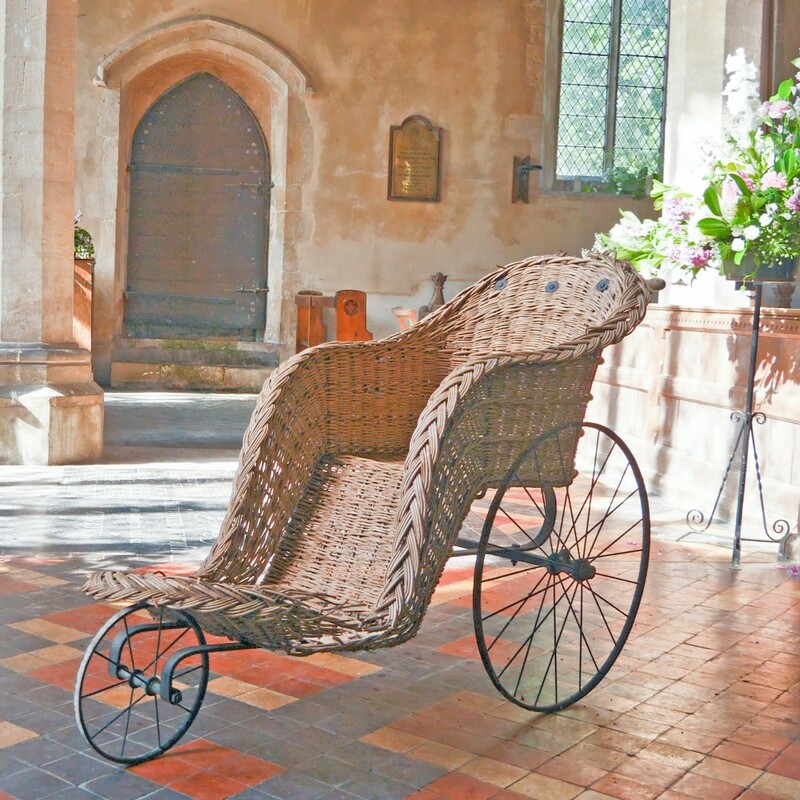 It is early English of the 13th century and is thought to have been built by John de Gurnay, the Rector 1294 - 1332. In the centre of the chancel floor there was a memorial brass of a priest. Around the edge is "Hic jacet corpus Joh'is de Gurnay quondam Rectoris Paronique hujus ecclesiecujus anime propicietur Deua.Amen" A chalice was found there in 1820. 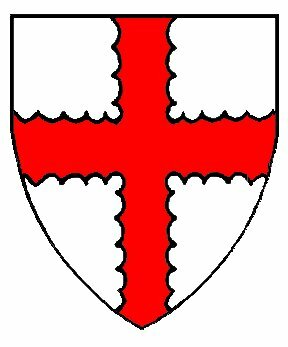 You can read a great deal more about the heraldric arms in Harpley. Click here. 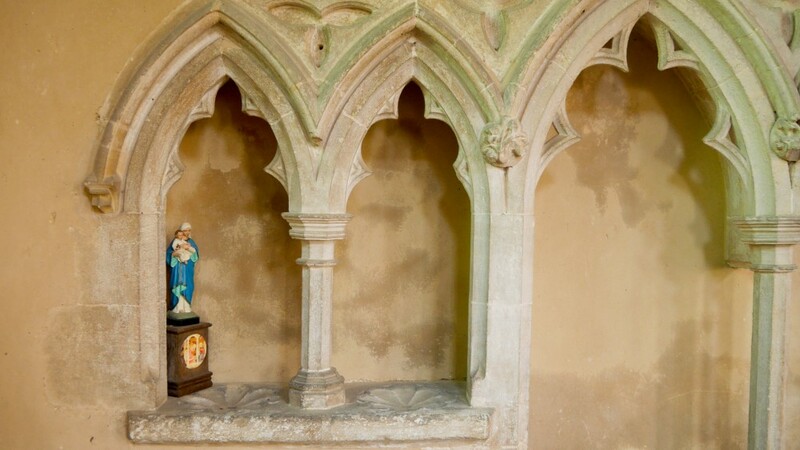 There is a doorway above the chancel arch; some say this was used to hang a veil over the rood during Lent and others suggest that a sanctus bell hung there. 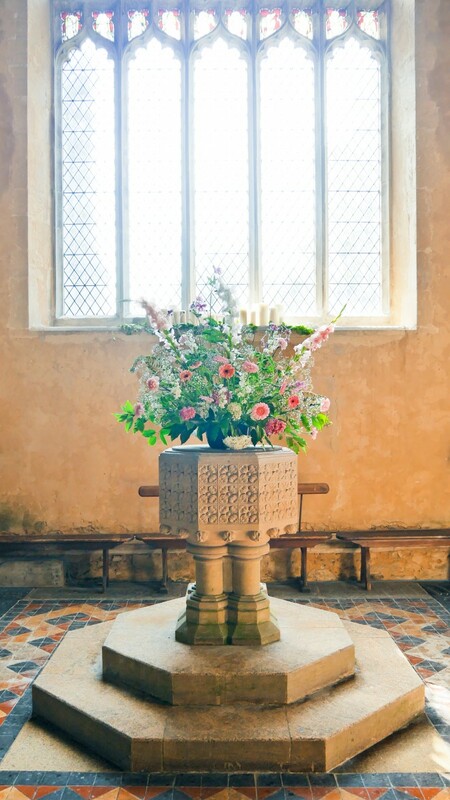 The chancel is the best part of the Church and is early 14th century, being a fine example of the decorated period. It has 3 windows on the South side. Starting at the Western end the first one has flowing looped tracery with some old stained glass. The second one has a barbed trefoil above two lights and the third has the more usual reticulated tracery with modern glass. 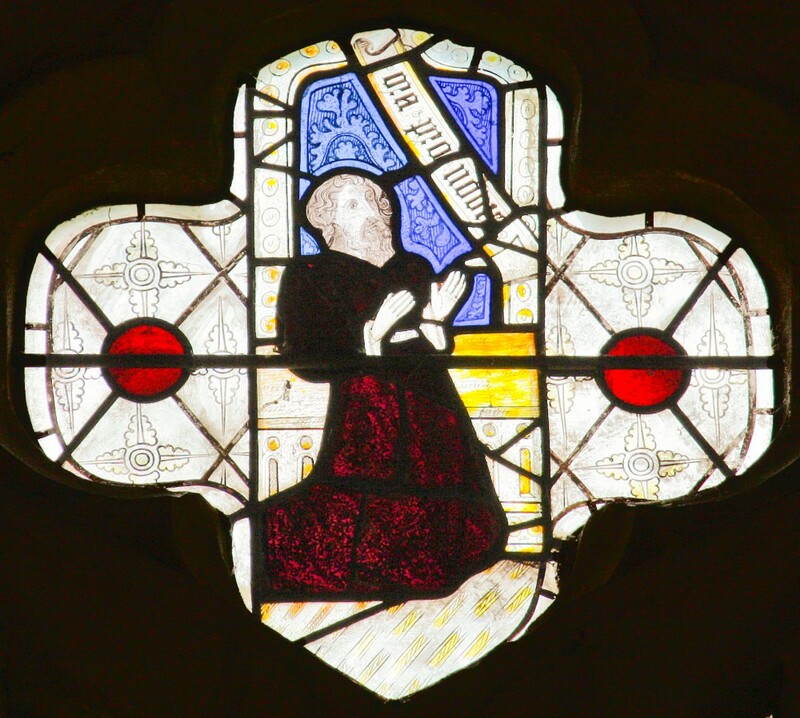 The 3 lights of this window are said to be identical with a window in the vestry at Merton College, Oxford, dating from 1310. 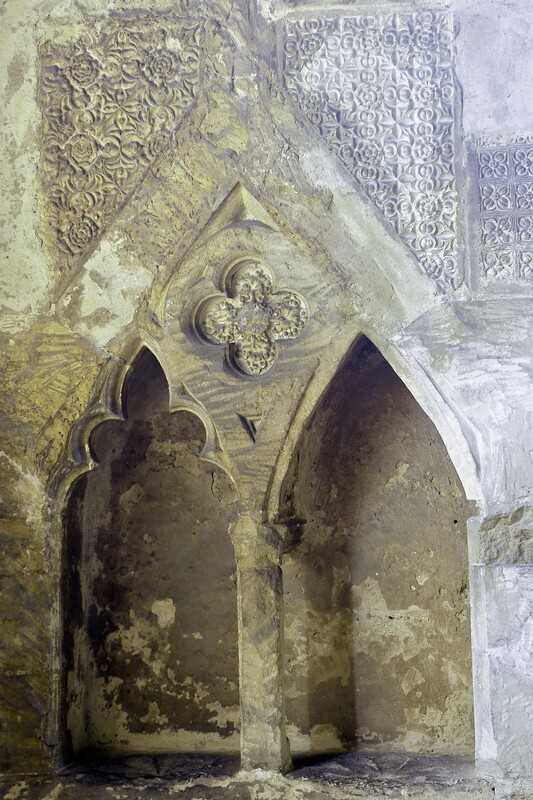 There are remains of an outstanding decorated double piscina and sedilla on the South wall with a canopy. The piscina dates from Edward 1, 1272 -1307 when it was though unseemly to wash the Mass vessels in the same bowl as the priest's hands. There is still enough detail to show how beautiful it originally was for it was much mutilated. The marks of Cromwell’s men’s picks are still there. There is an Easter Sepulchre on the North wall and to the West of it an elaborate doorway which leads to the vestry. It has a multicusped ogee arch and nicely restored open spandrels. The battlemented pillar above and the Easter Sepulchre are both perpendicular. 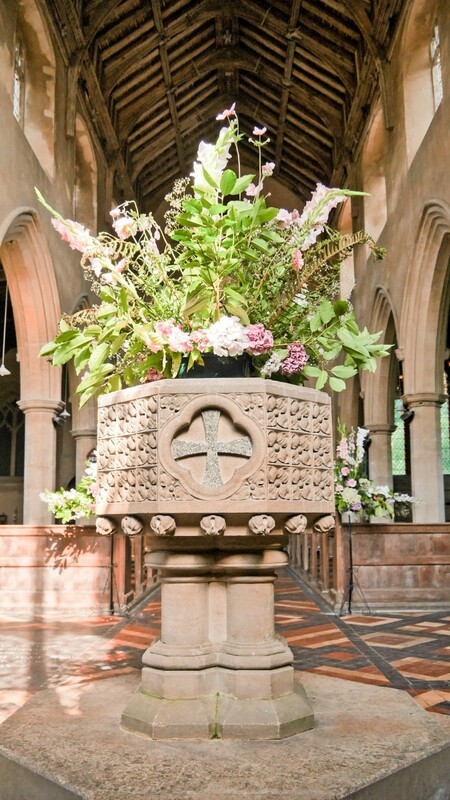 The font is Victorian, with panels of nine carved flowers on each side of the octagonal bowl, except facing West where there is a cross and the whole stands on four stout pillars. And finally, a relic from a bygone age.